Spin the wheel, make a salad! Many of you know how much I love my Bay Area Local Foods Wheel, a gorgeously illustrated and super-handy contraption that spins around to show you what foods are currently in season. Sometimes, when I’m in need of menu ideas, I’ll check in with my food wheel and see what’s coming in hot off the farms in order to use that for inspiration. So a couple of weeks ago I gave my wheel a twirl over to April and found (to my surprise, actually) that avocados and grapefruits are both currently au courant. (Do you like how I basically just said “currently current” but got away with it by putting one of them in French?) 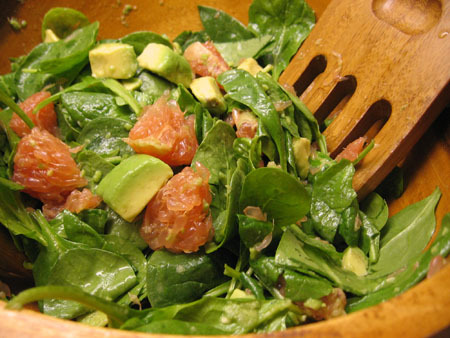 So I decided to make a recipe from one of my first and favorite cookbooks, Moosewood Low-Fat Favorites, called Spinach Avocado Grapefruit Salad. I had briefly perused the ingredients before going to the store, but when the time came to actually crack open the cookbook and make the recipe, I was a little shocked. The salad has no real dressing! Just a tiny bit of olive oil and a clove of garlic! Avocados and grapefruit are all very well and delicious, I thought to myself, but eating piles of unseasoned raw spinach doesn’t sound very appealing. But then I figured, Moosewood knows what they’re doing. They wouldn’t print a salad recipe with no dressing unless it really makes sense when you eat it. So I gave it a shot. And boy am I ever glad I did! I sort of vaguely remember what else I had for dinner that night (some sort of soup, was it?) but the star of the show was clearly the salad. The flavors were so bright, so fresh, so utterly delectable. And for those of my readers who are a little quicker on the ball than I am (you always know whodunnit it your mysteries, too, I bet), you can all shout it out together: Avocado + grapefruit + olive oil + garlic = creamy + acid + fat + garlic = the best salad dressing ever, obviously! This salad is so simple it dresses itself. Could there be anything better? This recipe is from Moosewood Low-Fat Favorites. I have added my usual overzealous detailed directions for certain parts. Combine the olive oil and garlic in a very small bowl. Stem and rinse the spinach. Spin or gently pat it dry. Tear the large leaves into smaller pieces but keep the small leaves whole. Put the spinach in a large bowl and toss with garlic and olive oil. Set aside. Halve the avocado and remove the pit. Carefully use a knife to slice the avocado into 1-inch slices, slicing vertically, while it is still inside its peel. Then slice horizontally once or twice, depending on how large you want your pieces to be. Use a large soup spoon to carefully scoop the already cut avocado pieces from their peels. Add them, along with the grapefruit, to the bowl of spinach. Sprinkle with salt and pepper, toss lightly, and serve immediately. Also tastes great the next day, so if you have leftovers, save ’em! I meant to submit this to the fantastic soup and salad blog event No Croutons Required, because this month they wanted salads featuring ingredients from the allium family. This was a perfect recipe because the garlic features so prominently, as one of only five ingredients! But I missed the deadline, so sad! The reason I’m telling you all this is to say that if you want to check out more fabulous alliumy soups and salads, you should check out the No Croutons round-up! This entry was posted in Recipes and tagged avocado, gluten-free, grapefruit, spinach, vegan. Such a pity you missed the deadline. Such a lovely salad 🙂 Don’t let it put you off entering again. I wanted to let you know I made this the other week. Very tasty. I really enjoyed it. It was even okay the next day for lunch. I was worried about the avocado going bad but it held up. Thanks for the recipe!